Netflix is coming out with a new documentary focusing on Mitt Romney during his run for the White House. 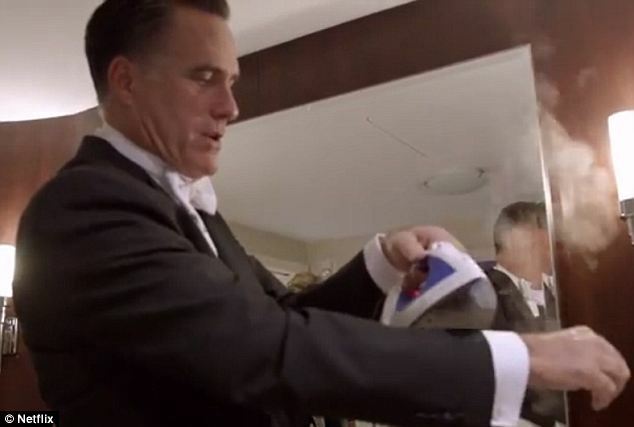 About a minute into the trailer, Mitt Romney is shown ironing his tuxedo..while wearing it. I don’t want to have to be the one to say it but that’s a psychopath move. I wouldn’t want my President ironing his clothes while they’re on his body. You just can’t trust someone like that. I’m not saying this cost him the election, but I can’t imagine it helped. Maybe stick to taking selfies like Obama. It involves less physical pain. Whether you like Mitt or not, this documentary does look pretty interesting, so it’s safe to say I’ll be tuning in January 24th. Posted on December 19, 2013, in Average Blog Posts and tagged clothes, documentary, iron, mitt, netflix, romney. Bookmark the permalink. Leave a comment.